About 3.35 Mio CHF are available for upgrading the railway station Hardbrücke. Selective measures are used to strengthen the identity of the railway station, facilitate the orientation and upgrade the areaway. Being visible for a long way two big illuminated panels tie the railway station to the fabric of the city. On the upper level of the Hardbruecke the panels establish a visual relationship across the road. 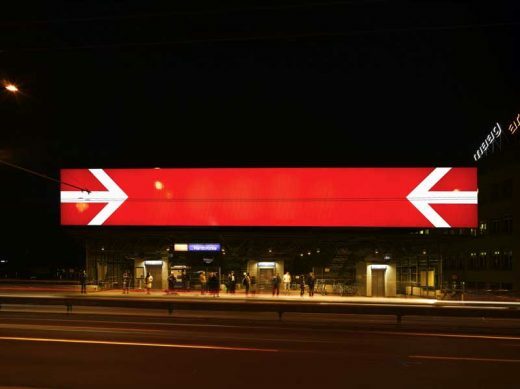 Also the entrance to the station is marked by a large illuminated panel. The indoor spaces are being cleared and gain an evident visual appearance with a clearly arranged orientation system. The design of colours and signals are derived from the approved appearance of the SBB (FIS basic elements/colour trilogy red, blue, white). The space under the Hardbrücke in front of the ramp is used to form a spacious station hall. By reorganizing the parking lots and the access road the pedestrian area is extended and programmatically upgraded with a sandwich bar.